Green Crack by Ohm Beads ($40 USD/$50 CAN) was partly inspired (I think!) by the gorgeous forests of the Pacific Northwest. 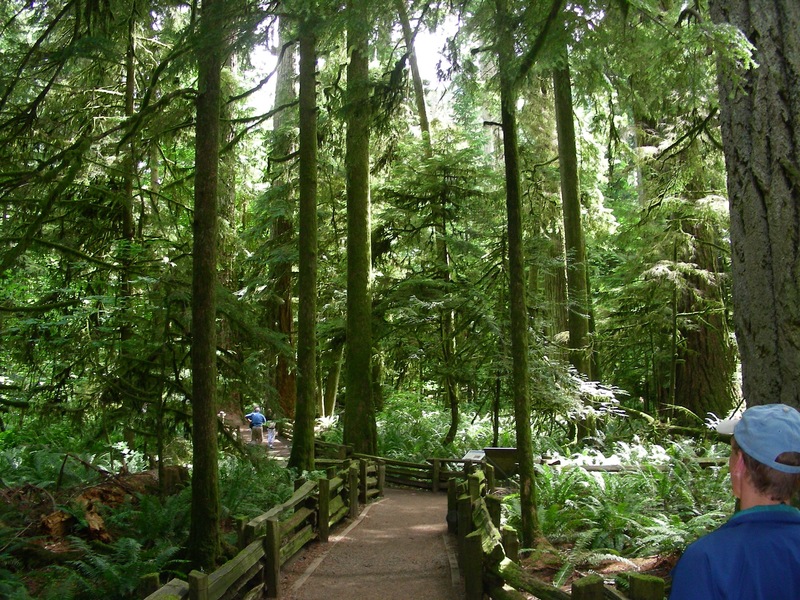 This is Cathedral Grove on Vancouver Island in Canada, so a bit north of where the Ohmies live. The bead is the barrel shape and even thought it looks broken, you don’t have to worry about it. There is a fine layer of glass, I believe, over the cracks so nothing gets caught. It’s a really cool effect. The glass is limited edition, so if you want it don’t leave it for a year or anything. It is so pretty with different shades of green and maybe even a little yellow in there. At first I thought to use it with the two Blue Holes I have, plus UFO and Live. Due to the green I thought Gnome Home would look cute with it. Green and purple always look nice together, so I used Dreamscape and Purple Haze with two Trees beads. I love this bangle! 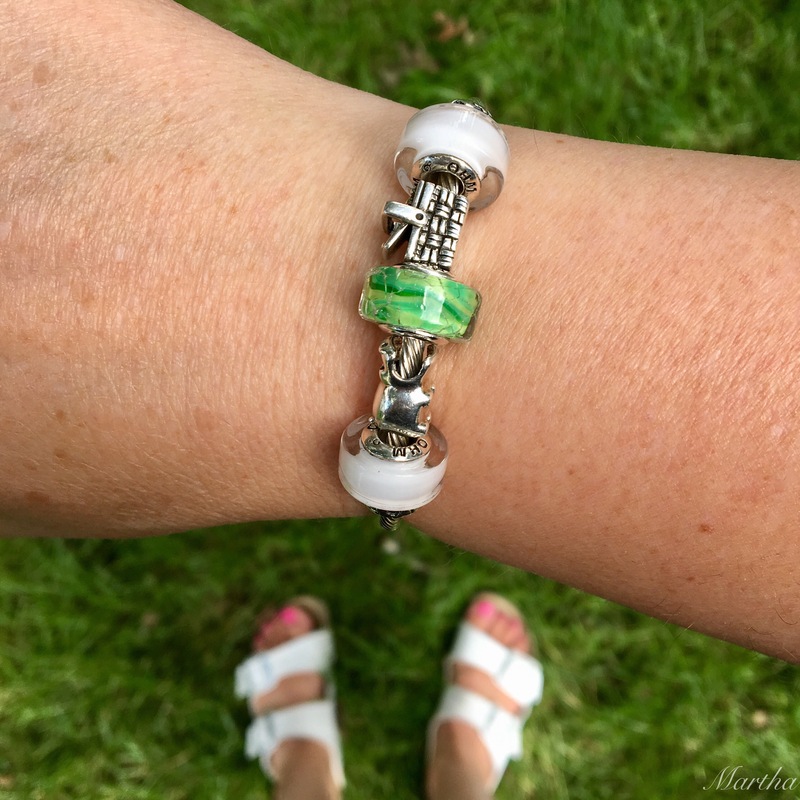 Here is a green and white bangle with Growling Hippo and Picnic Basket. Since Cold Milks are no longer available a good substitute would be True Beadz True Air Siberia. I had a mess of beads in my little corner of our breakfast bar in the kitchen and the Trollbeads Seabed Stripe was sitting right there. It looked like the green stripe matched the Green Crack and then I added in the Light Turquoise Prisms. Since I had one barrel shaped bead and one traditional shaped one, I decided to put the silver Live bead off to the side. Next up is a full bracelet. I think Sock Monster is irritated because he doesn’t like the drink that is in the Ohm Jar bead. I did want to try the Green Crack with orange, so made up a brightly coloured fun bangle. Left to right are Live Your Fantasy, Blue Hole, Fly, Strawberry, Expand, Blue Hole and Green Crack. Anyway, what are everyone’s thoughts on Green Crack? I think it’s wonderfully fresh for the summertime but do wish it was not a Limited Edition but going to be a regular collection bead. As of a couple of days ago Perlen still had some Dreamscapes, if anyone is looking for those. 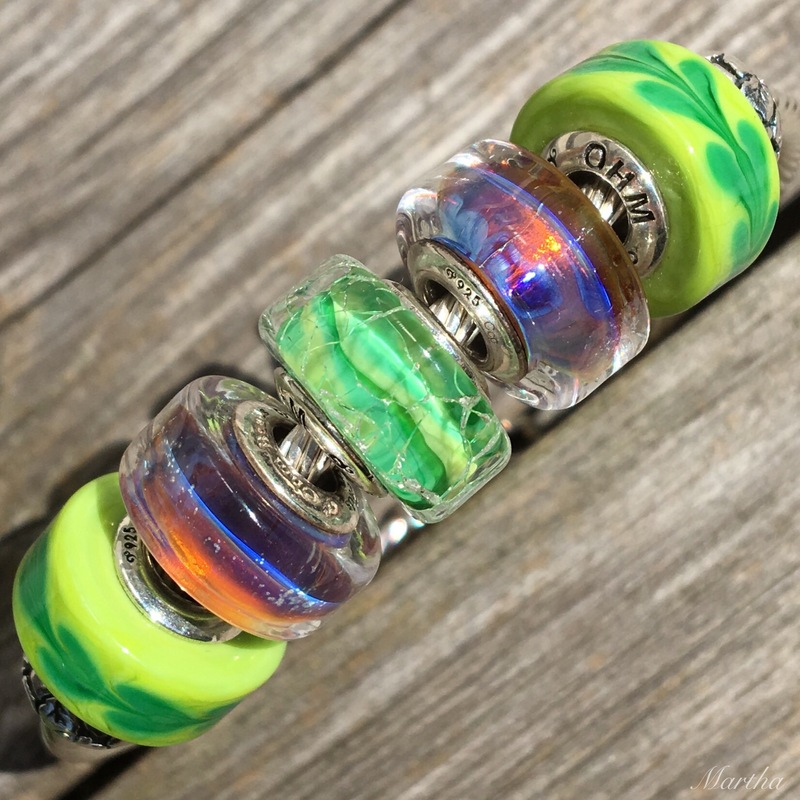 Ohm Beads USA still has Luminous, Reflections, Trees, Strawberry, Rainbowed and of course, Green Crack. They can be purchased here. This is an affiliate link, meaning if someone makes a purchase I would get a small percentage. That’s what those two ads on the right hand side are, also. Anyway, the next blog post will be on The Feelings collection. I’m away today with the beads n’ coffee gang but hope to have some wifi at lunch so would love to hear some feedback! That’s a really cool bead! I like the swirling effect of the different shades of green. I think my favorite of your combos is the green and purple bangle. That’s one of my favorite color combinations. But the others are really fun too. 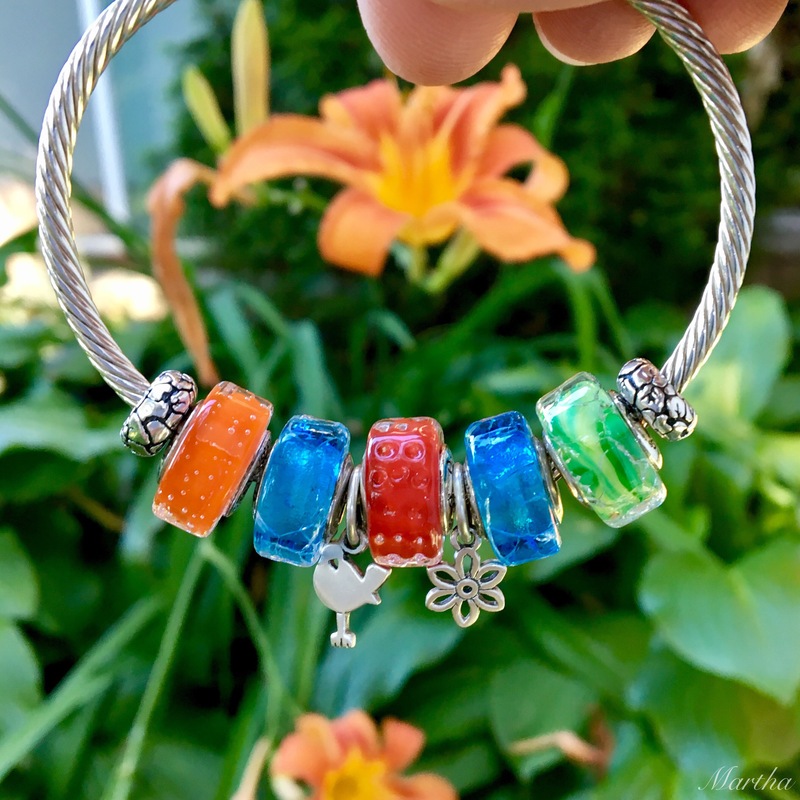 The bright Ohm glass is just perfect for cheerful summer bracelets! Kim, I think that must have bit it-there should of at least been a splash of vodka or gin in there! I agree the the green is perfect for the summer! So…. 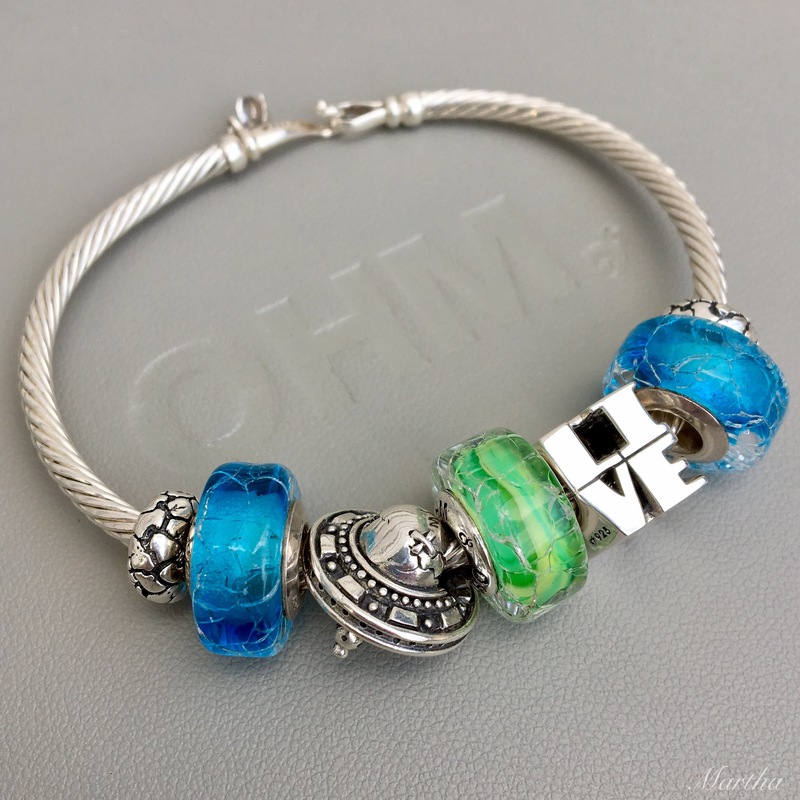 I had never heard of Ohm Beads before I started following your blog! 😱 I must say, they have some very cute and clever silver beads, and their glass ones are really cool! 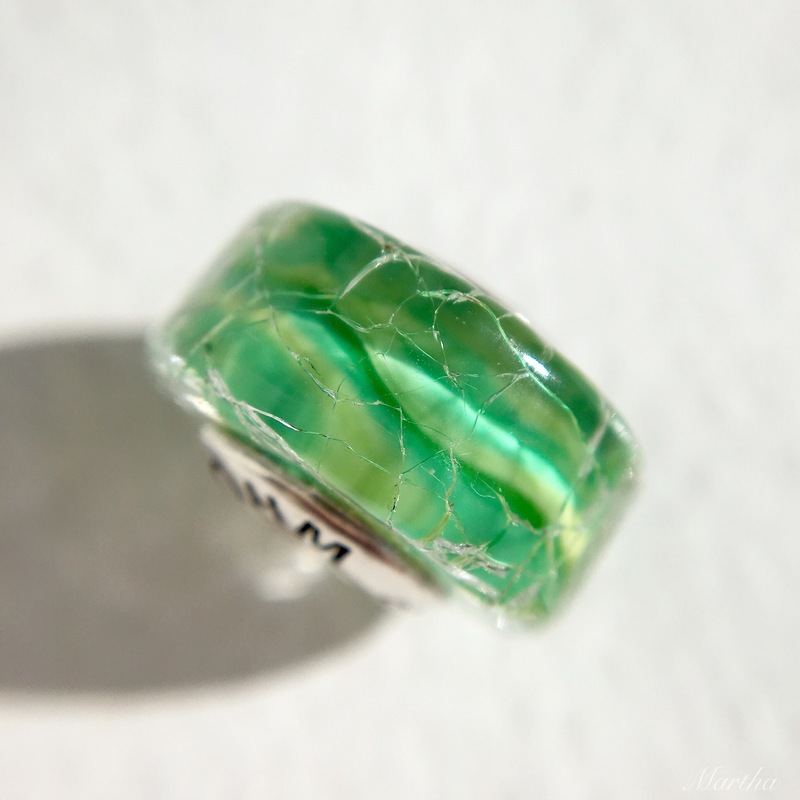 I LOVE fresh green, so the green cracked glass jumps out at me for sure. Do the Ohms have large cores? It looks like they are quite compatible with Troll bracelets. I predict an Ohm internet shopping trip in my future (via affiliate link! 😉 )…! Oh yes, those are very much West Coast colours! Hi Martha, First, I hope you’re having a great time today with your friends .When I first saw the Green Crack bead, I wasn’t sure how I felt about it or if I would want it. Now that I have seen quite a few combinations using it, I have to say that I am really starting to like it. The purple and green bangle is my favorite also. You know you did put the jar where Sock Monster can’t reach it! Hi Suzanne! We had a fabulous time today! We all bought beads and Cheezits! We don’t have Cheezits in Canada so always stock up when we are in the USA. We went to a branded Trollbeads store and just about fell over when we saw the rows and rows of Uniques. It was incredible! Good point about the Jar being away from Sock Monster! He must have been thirsty! I love Cheezits… especially the White Cheddar ones!!! I can’t even imagine being in a Trollbeads store like that….I would be so nervous! There’s a jewelry store near me that sells Trollbeads, but it’s just a display case in the back of the store, and it’s very random. 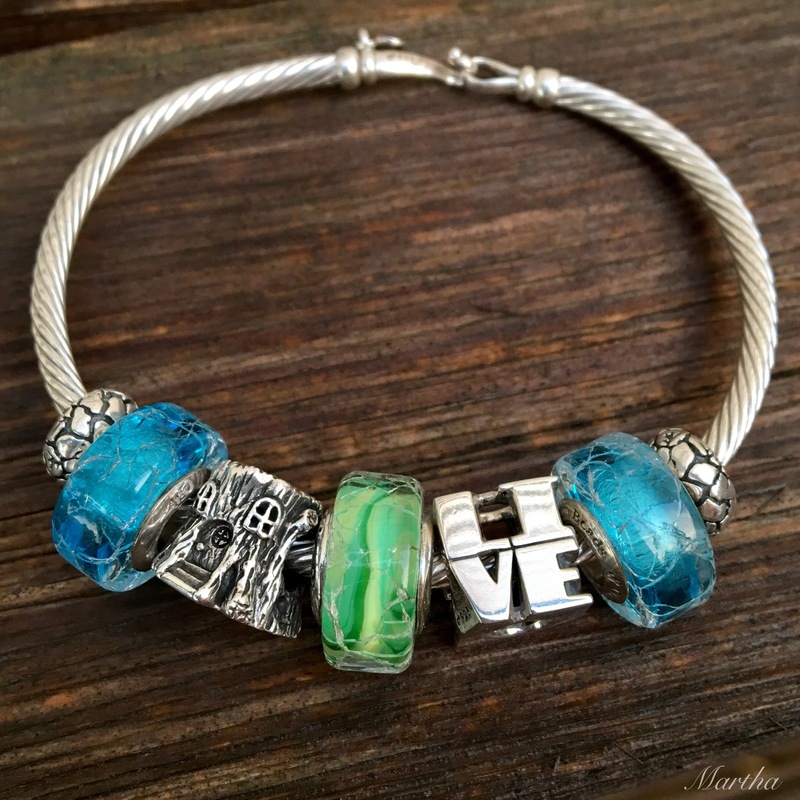 I’ve been working so hard looking for the retired Trollbeads that I want, that I don’t have any Uniques at all. I’m curious…. 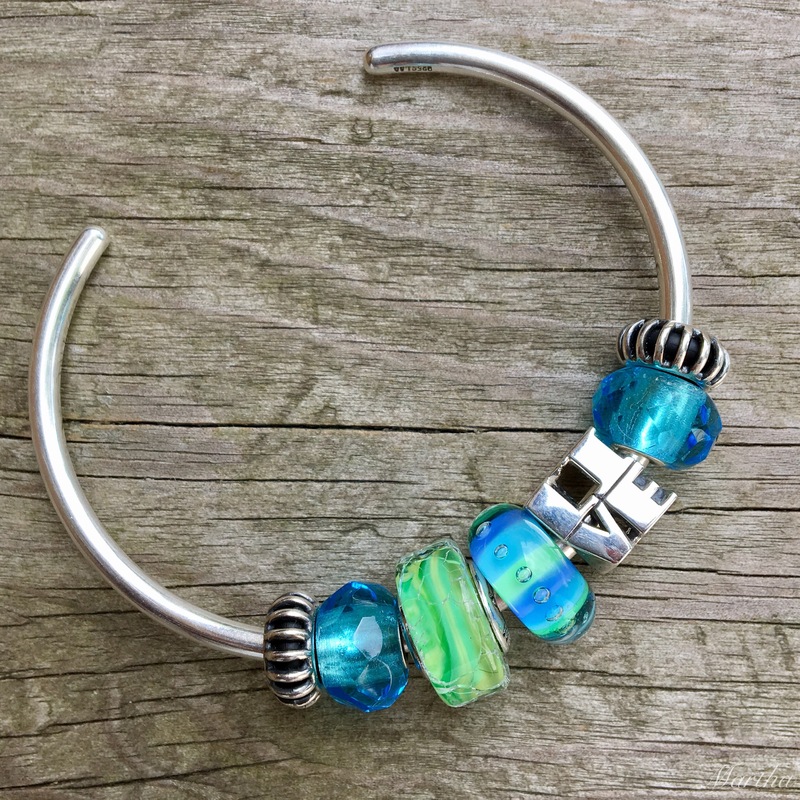 did you wear “only” Trollbeads when you went? I love the bead. I’ll get pair at the end of the month with a vouple of other limited edition or retired beads I still need to buy. Thanks Alexandra, I also really love the green and purple together. It has been a bit tricky with all the limited edition glass because I don’t want to show people things they can’t buy, but I kind of have to as beads like Purple Haze look so fantastic with the Green Crack. You are clever to have a purchasing plan! Love your photo of the forest. My favorite combination is the one with the hippo, picnic basket and the Cold Milk glass beads. The glass matches your sandals perfectly! I like every single combo and suddenly wish there was an Ohm Store nearby, too! Wouldn’t that be fun? I love the combo with the orange lilies in the background. We must plan to go to another bead event sometime as it was so amazing to see the Ohm beads in person at Mentor last year. 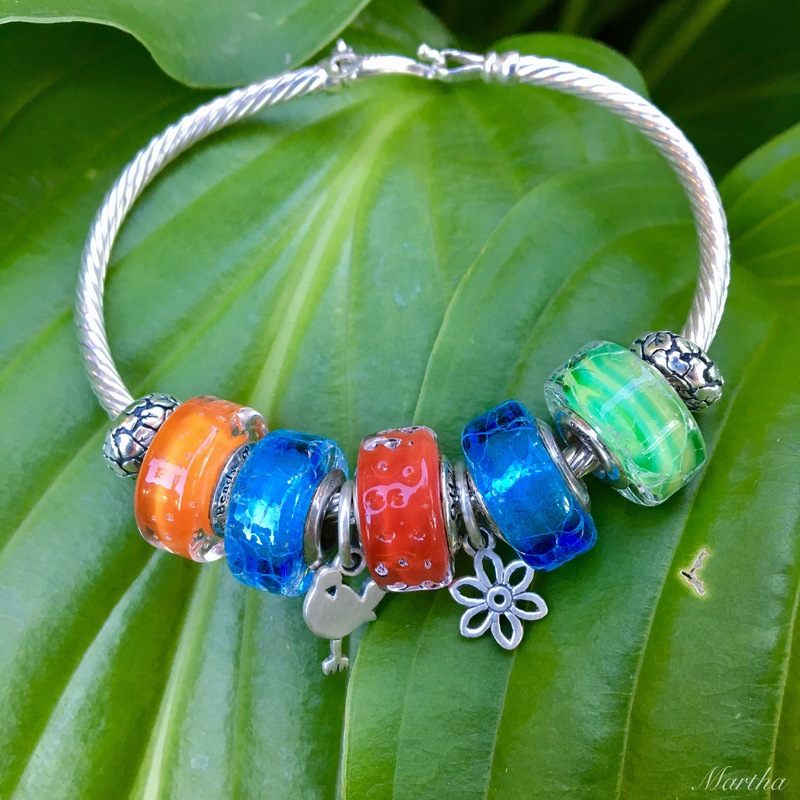 Hi Martha, I just saw on your Instagram photos the beads that you got on your field trip to the Trollbeads store. I love how you say in one of the comments that you drove 3 hrs. to another country! I am loving your Dragonfly Unique and the bird…but Oh, that “buttery” amber bead love! love! love! Hi Suzanne! Funny you should say that about the amber. I just saw Guys and Dolls at the Stratford Festival (great production!) and I am wearing the bangle with the amber and the bird. The amber feels really neat-quite different from glass. I have a concert this weekend but if I have time maybe I’ll do a blog post on my purchases! 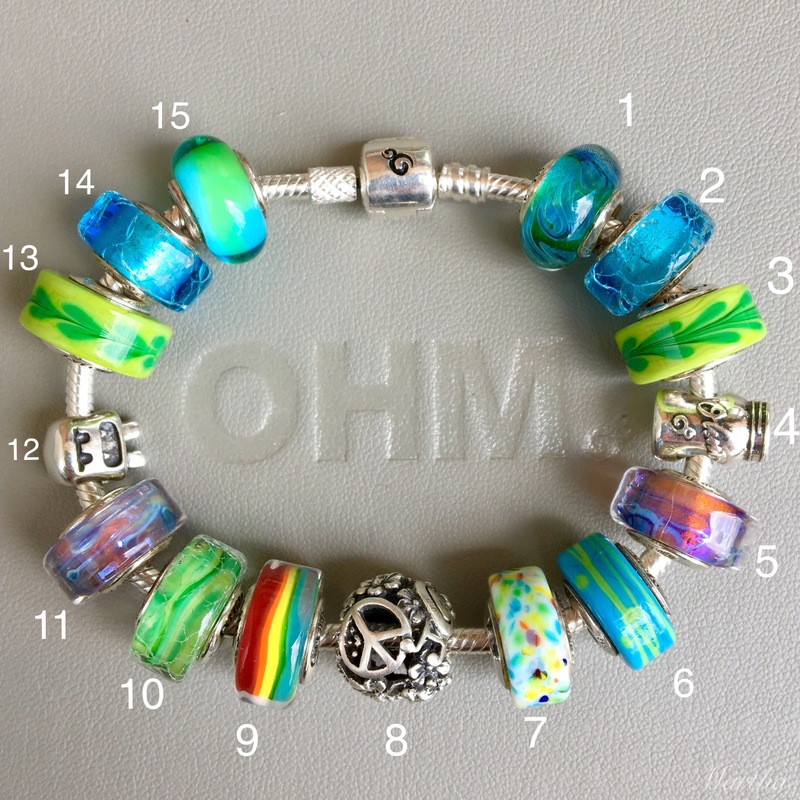 Ohm’s Feelings beads are coming up tomorrow, if I can get it written up tonight-the photos are already done. I am interested to see how the Ohm Feelings beads look alongside other beads. I’m picturing them to be very small…I don’t know why. I am thinking of getting Self Conscious and Worry…not sure about the others. But I’m sure you’ll probably sway me when I see what you’ve done with them…. You are correct, they are very small. I think they are a very personal set of beads and not really about the design so much (although they are very cute!) as the meaning. As such, I really didn’t make too many combos. They work perfectly on the Redbalifrog leather straps and Trollbeads leather bracelets. I will be able to get the blog post done by tomorrow and will be curious what you think of them!